When a Genero Studio module is launched, the framework is displayed and all other windows and views, menus, Toolbars, and icons are contained within. Tip: In addition to using the Close icon (a red "X"), you can close a tab in the Central Workspace by clicking the mouse wheel on the tab label. The Welcome Page is displayed when Genero Studio is launched. From the Welcome Page, open a recent or sample project or configure the environment or database connection. Genero Studio is made up of modules managing the design, development, and execution of Genero reports and applications. 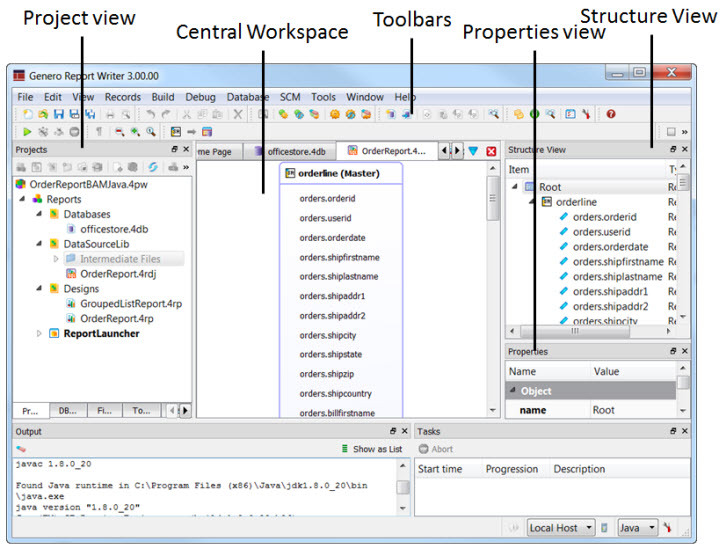 Menus and Toolbars are constructed dynamically depending on the context and the currently active module. Views are the panels in the Genero Studio framework that display information about the current document or project. A document refers to a file that you view in the central work area. Dialogs display as the result of a selected action. In most cases, you must complete the dialog to continue. The Genero Workplace Window provides a command-line interface, using the environment of your current configuration or project. This allows you, for example, to run the Genero Studio commands (such as gsreport and gsmake) within the correct environment. Genero Studio software and documentation can be updated via the internet.